Director: Neem BashaWriters: Neem BashaStars: Thomas Gipson, Nicole M. Carroll, Michael LiederSummary: As if Daniel and Angelica's night could get any worse (she's accusing him of cheating on her! ), enter Andy and Bret, two home invaders with a wicked sense of humor who are looking to rob the affluent couple of more than just their belongings. 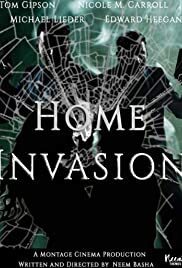 "Home Invasion" is a dark comedy thriller that will leave you guessing until the very end.